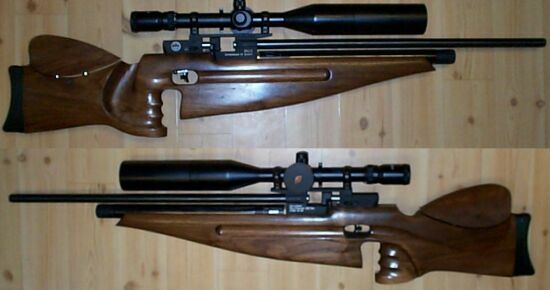 The RN-10 is an Air Arms pellet rifle shooting a .177 caliber pellet at a speed/power not to exceed 20FPE. It seems to have a Gary Cane Custom Stock and a Tasco 8-40x56 side-wheel scope. This is typically called a "Field Target Rifle" whereby shooter shoot from a sitting position at metal targets that are shaped as animals. the targets normally have a kill zone of 10,20,30 and 40 mm and are set at distances from 10 to 55 meters.